French President Emmanuel Macron has said that there is “no indication” of Iran breaching the nuclear deal. 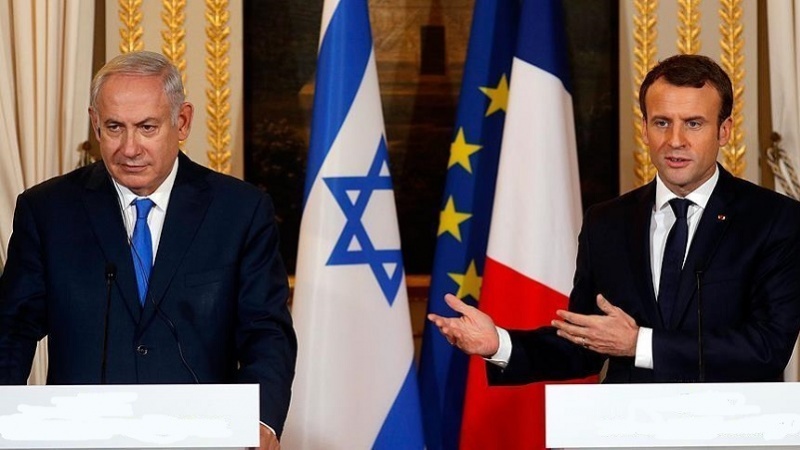 According to Press TV, Macron made remarks during at a press conference with visiting Zionist regime’s Prime Minister Benjamin Netanyahu on Tuesday. “If you consider it insufficient but that it’s a step forward from what exist before, it’s better to keep it,” he added. Macron went on to stress the importance of deescalating the situation in order to avoid conflict. He further noted that it was solid common sense that Washington’s move in ditching the deal would not encourage other parties to respect their obligations. “When you decide to bring an end to a deal on your side, that does not encourage the other party to respect it,” he said, calling this “solid common sense”. The Zionist regime’s premier stressed he had not asked France to pull out of the deal because it would collapse under the pressure of reinstated US sanctions. “I did not ask President Macron to leave the deal. I think that economic realities are going to decide this matter, so it’s not what we focused on,” he noted. “What we focused on, and what I focused on, is how to stop Iranian aggression in the region,” he said. Netanyahu, who has been vilifying the Joint Comprehensive Plan of Action (JCPOA) since its conclusion in 2015, cranked up his rhetoric against the deal after Trump’s move. Contrary to the US and Zionist regime, Europe insists the 2015 agreement works and Iran has respected it as repeatedly confirmed by the International Atomic Energy Agency (IAEA). Earlier in the day, the EU said a “first assessment” indicated that Iran’s declared intention to increase uranium enrichment capacity did not violate Tehran’s commitments under the nuclear agreement. The Atomic Energy Organization of Iran (AEOI) said on Tuesday that the country has begun work to prepare the infrastructure for building advanced centrifuges at its Natanz enrichment facility, while respecting its commitments under the JCPOA. The announcement came a day after Leader of the Islamic Revolution Ayatollah Seyyed Ali Khamenei ordered the AOEI to make preparations for enrichment of uranium up to a level of 190,000SWU (Separative Work Unit) without any delay in case of a potential collapse of the Iran nuclear deal.